Halfway between the straight species and 'White Ness' we have 'Ingerwersen's Variety'. Like the other members of its clan it bears large, upright flowers above its pale green, lobed, fragrant foliage. Instead of a deep pink or pure white, this cultivar boasts pale pink blooms. A single plant was found on Mount Koprivnik, Montenegro, Yugoslavia, by Walter Ingerwersen in 1929 amongst a stand of 'regular' plants. He collected it, bred it, and now you too can enjoy it in your garden! 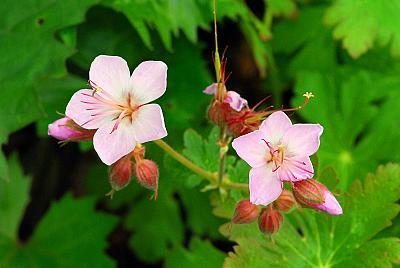 Peter Yeo, author of Hardy Geraniums, lists it as the "best form [of bigroot geranium] for the herbaceous border." I'd have to agree.